A new leak from the mega-publisher Electronic Arts reveals a marketing plan for two of the company’s smaller games, and while there’s nothing particularly extraordinary in here, it makes for an interesting peek inside the sausage factory. The marketing plan was first posted last week by Reddit user OldSoul2, who said he had been accidentally getting e-mails from EA and uploaded one of them, which contains roadmaps for the upcoming games Fe and A Way Out. Although EA has not acknowledged the leak—and did not respond to a request for comment—last night at The Game Awards, the publisher showed a new trailer for A Way Out (called “Meet Vincent & Leo”) that lines up with this plan. 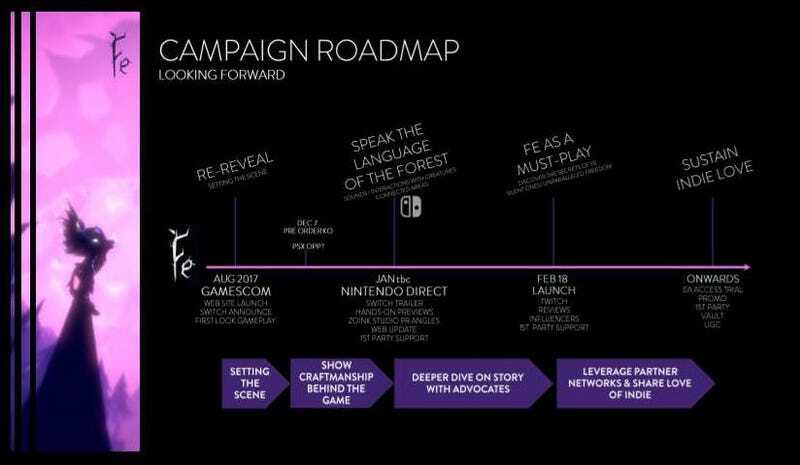 Fe, which was announced at E3 2016, is described as “well received” but EA says it has “not seen anything spark it to cut through the noise,” noting that the trailer has 500,000 views. There’s apparently a Nintendo Direct coming in January, and EA plans to show Fe for the Switch then. EA expects to sell 707,000 total copies of Fe and 894,000 total copies of A Way Out. To promote the co-op prison break game A Way Out, EA hopes to “leverage relevant influencers to create Let’s Plays” with director Josef Fares. That said, EA warns, in my favorite line of this whole thing: “Josef as a personality is a plus, his passion is great, but need to watch out for controversy.” After watching last night’s speech, that sure seems prescient. Now don’t you want to see the plans like this for Star Wars Battlefront II?